The Regular Classes page for classes that run over a period. The Playing Days page for SRP branch playing days. The Training page for one-day workshops run by the SRP. Courses and Workshops about recorder making and repair are listed on the Instrument Suppliers page. Ann and Steve Marshall run several recorder courses, advertised here and on their website. Spring and summer workshops recorder consort in a lovely Spanish cottage on the countryside near Madrid. For groups of three or four recorder players. Individuals welcome to apply too. Choose your own week between 27th April and 1st September. 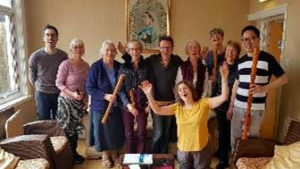 Manor Farm Music Frivolities runs recorder sessions, including those for adult beginners. All through the year we organise recorder courses for around 10 players and often a few non-playing other-halves. We attract the best tutors from around the world and so you are guaranteed an engaging course which can be tailored to the needs of the people on the course. Courses vary from a few days to a week and from Beginners to Diploma standard. Why not have a look at our website to see what tutors and courses we have coming up! We pride ourselves on our home cooked food and homely atmosphere. Bring your slippers and enjoy having fun whilst learning to play the recorder.